I recreated my favourite appetizer from a local restaurant (Kingston, ON). Ed and I may be a bit biased, but we like my version better. That’s probably because I was able to use my favourite brand of smoked salmon. Of all of the pre-packaged smoked salmon brands that I’ve tried (and I have tried many), Norwegian Fjord’s Smoked Norwegian Steelhead Salmon is my favourite. I have only ever seen this brand at Costco. I’ve made these for parties and pot lucks and they never last long. They are extremely easy to make. Notes: I highly recommend that you make the pickled red onions. They add the most pleasant sweetness (surprise!) and texture to this crostini. 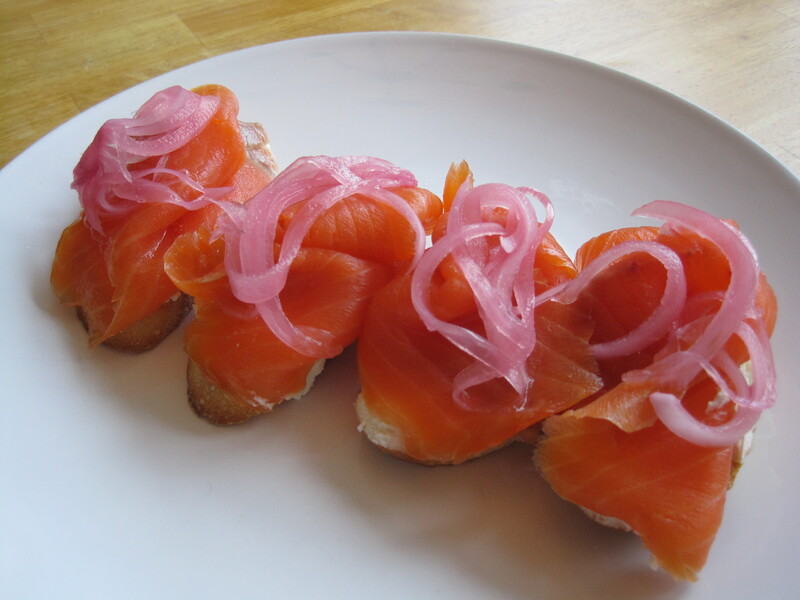 Smoked salmon is more commonly served with capers. Capers would also enhance the visual appeal of crostini. However, I usually leave them off because they add too much sodium to the already salty salmon for my taste (and health). Preheat the oven to 375 F. Lay the baguette slices on a baking sheet and bake until toasted on the surface but still soft on the inside, about 7 minutes. Set aside when done. Ideally you want the bread to be crunchy and chewy when you bite into it. Meanwhile, mix the mascarpone cheese with the lemon juice and black pepper. Spread this mixture onto each baguette slice. Top each one with a large slice of smoked salmon. For aesthetics, bunch up, partially fold, and twist the salmon as you lay it down. If using, top with a small bunch of pickled red onions and a few capers. Serve with a few wedges of lemon (optional). This is really, really good. Much better than the ones made a specific Kingston restauraunt that I won’t mention by name.